Are you looking for a new and challenging sport? Come and play Ultimate Frisbee with Panic! Ultimate Frisbee is a fast, fun and furious combination of the best qualities of football, basketball, American Football and a flying disc. Demanding tactical choices at a high pace, Ultimate is a varied sport with a lot of depth. A major difference with most sports is Ultimate's emphasis on Spirit. Games are played without referees, which ensures players themselves are responsible for an orderly conduct of the game. Because sportsmanship is so important, matches are both very physically demanding and tons of fun - with a big party after the games! Panic! members include students from Leiden and abroad, as well as post-docs. We play competitions and tournaments all year, both indoor and out. Our teams are mixed, with both highly experienced players and rookies playing at the same time - so you can easily pick up the basics, but will always be challenged at your level. Join us at our training on Mondays (outdoor) or Wednesdays (indoor) and taste the magic that is Ultimate Frisbee! Our training is always in English! In order to join this sport you need a valid sports membership. Additional expenses: contribution to the Ultimate Frisbee Association. For more information consult the association’s website. 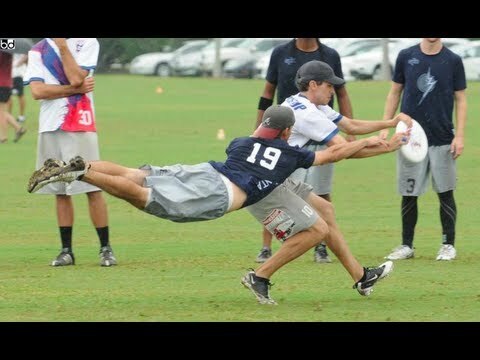 Ultimate Frisbee (often called Ultimate in short) is an energetic, non-contact team sport. It is a mixture of sports containing the best elements of football, basketball and American football. All-in-all a fascinating sport for men and women.